As promised, here is a bibliography with original documents such as Evening Telegram articles, the WPA's published magazine called The Distaff and photos. Also included are books and articles. I hope this compilation quenches your interest! Patriotic Association of the Women of Newfoundland (W.P.A.) fonds.MG 635, 1914-1921, 1939-1948, predominant 1939-1945. Archives and Special Collections - Mary Southcott Collection, Queen Elizabeth II Library. Volume 16: Number 1, July 1916, “Outlook Beyond the War,” p. 3, 10. http://collections.mun.ca/PDFs/quarterly/NQ_Volume16_Number1.pdf. 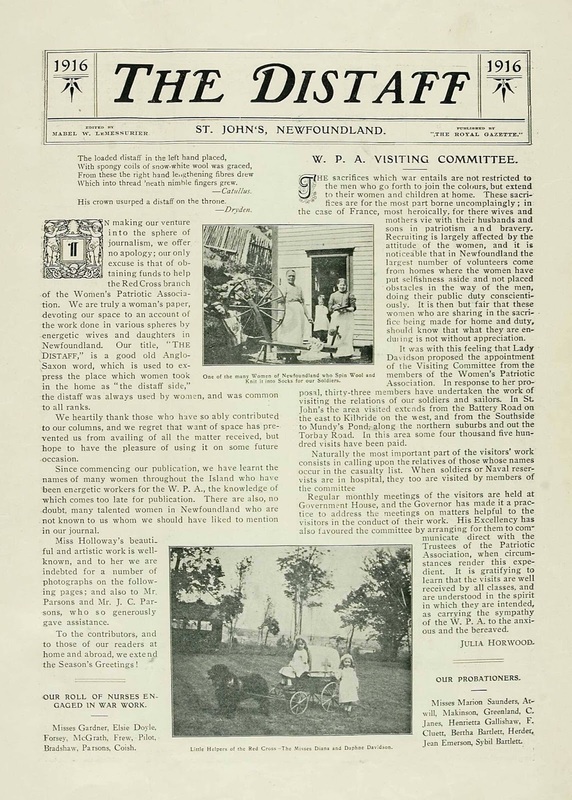 Volume 17: Number 1, July 1917, “Newfoundland and the War - Patriotic Work,” p. 4. Number 4: April 1918, “Empire Honours - Newfoundland List,” p. 5. Volume 18: Number 1, July 1918, “Empire Honours - Newfoundland,” p. 5-6. http://collections.mun.ca/PDFs/quarterly/NQ_Volume18_Number1.pdf. “Ladies’ Patriotic Movement: Women’s Association Formed - Address of Lady Davidson,” September 1, 1914, p. 8. “Women’s Patriotic Association,” September 15, 1914, p. 5. “For Our Soldiers,” September 24,1914, p. 7. http://collections.mun.ca/cdm/compoundobject/collection/telegram19/id/2810/rec/19. “W.P.A. Second Shipment,” December 14, 1914, p. 7. “Women’s Patriotic Association Meeting,” October 1, 1917, p. 3. ** These are of particular interest but there are other volumes mentioning the WPA. The Distaff 1916. 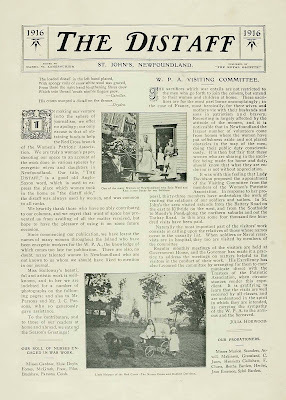 St. John’s: The Royal Gazette, 1916. http://collections.mun.ca/PDFs/cns/Distaff1916.pdf. The Distaff 1917. St. John’s: The Royal Gazette, 1917. http://collections.mun.ca/PDFs/cns/Distaff1917.pdf. Bishop Stirling, Terry. “Women's Mobilization for War (Newfoundland).” In 1914-1918-online. International Encyclopedia of the First World War, ed. by Ute Daniel, Peter Gatrell, Oliver Janz, Heather Jones, Jennifer Keene, Alan Kramer, and Bill Nasson, issued by Freie Universität Berlin, Berlin 2015-09-30. DOI: http://dx.doi.org/10.15463/ie1418.10736. Duley Margot I. “The Unquiet Knitters of Newfoundland: from Mothers of the Regiment to Mothers of the Nation.” In A Sisterhood of Suffering and Service: Women and Girls of Canada and Newfoundland during the First World War, edited by Sarah Glassford and Amy Shaw, 51-75.Vancouver: UBC Press, 2012. Duley, Margot I. Where Once Our Mothers Stood We Stand: Women's Suffrage in Newfoundland, 1890-1925. Charlottetown: Gynergy, 1993. Duley, Tryphena. A pair of grey socks: facts and fancies. St. John’s, 1916. http://collections.mun.ca/PDFs/cns_wom_lit/PairOfGreySocks.pdf. Heritage Newfoundland and Labrador. “Women’s Patriotic Association.” Last modified April 2015. http://www.heritage.nf.ca/first-world-war/articles/womens-patriotic-association-en.php. Thanks to Terry Bishop Stirling for providing sources to this bibliography. I have a broach given to my Grandmother, with the the letters. "Patriotic Association of Newfoundland Women". It has a Caribou head in the centre. I asked my mother about it, she is now 99 years of age. She told me her mother received it for knitting socks for the soldiers. Just trying to find out more about it, it sparked my interest more now that we are celebrating 100 years anniversary.